My mom always had loads of houseplants when I grew up. She says she had even gotten rid of most of them when she was pregnant because she couldn't stand the smell of the soil. (Don't you laugh at my mama!) We had a garden out back with a few tomato plants, usually a bell pepper or two, sometimes some cucumbers. As soon as I was old enough, I got to help water the garden. One fine year, I got to start planting my own flower garden. Mom would take me to the store and let me pick out all the marigolds, petunias, and snapdragons that my little heart desired. I got to plan where they'd go and plant them all myself. I remember the little wire fence that I put around my garden with fondness. I kind of dropped out of gardening for a while until I met my husband. Scott has the ORIGINAL green thumb. Soon we were expanding the garden at our city house from a few raised beds to a 20 foot square. Then we bit the bullet and just fenced in that corner of the yard so we could enlarge the garden even more and keep the dogs out. It was a far cry from the half-dozen tomato plants I remembered growing up--one year we had 20. There was a blackberry bramble (courtesy of one dog who chewed up the wands and they sprouted where they lay) which choked out the strawberry patch, okra, peppers of various size and heat, lettuce, gooseberries, rhubarb . . .such a bounty. If you could see the size of the gardens (yes, plural) out here, you'd understand why we tend to go a little overboard. And by overboard, we're trying to raise double what we did in town, at least. There IS no such thing as too many tomatoes. Fresh peas, onions, carrots, potatoes . . .and the best part, the asparagus bed. Of course, with this cornucopia surrounding us, come weeds. Most of them I can identify, but last year I really was thankful for the Internet. Internet and weeds? Huh? I know, I hear you. I was so excited when I saw the flattish white heads of flowers. That's got to be Queen Anne's Lace, I thought. I'd heard that the seeds are a natural birth control. Well, since I don't need that anymore, I thought hey, these folks are selling it online. They've got to get their seeds from somewhere, right? Why not me? So I promptly embarked on a campaign to educate myself on when and how to gather the seeds. It's a really good thing I did. 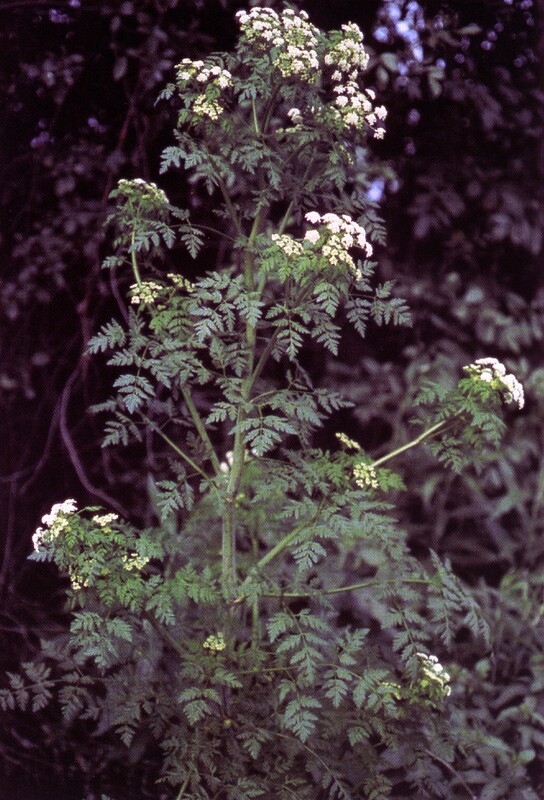 It turns out that what we have in an incredible (and annoying) abundance out here is poison hemlock. It looks a lot like QAL, but it gets way taller and has purple on the stems. Yep, that sounded like ours. I was crushed. It's a good thing I didn't try to sell the seeds--people would have died. Still, I wish that I'd collected them . . .because we have 3 times as much of the nasty stuff than we did last year. When I pick greens for the chickens, I have to double check to make sure there's no hemlock in that patch. You can cut it down. It grows back. You could spray it . . .but we can't because we're pesticide free. I'm thinking really hard about seeing if Ralph's weed dragon would help wipe it out. It's literally everywhere. Sure, it looks pretty. I just wish the raccoons, possums, and skunks would develop a taste for it. I sure haven't. So steer clear of this, folks. I'd rather you die laughing!